OMT Advanced Spinal Manipulation is tailored to meet the needs of participants in addressing frequently encountered problems with the safe and effective delivery of specific HVT thrust techniques, it looks to build your existing knowledge within HVT spinal manipulation and developing and refining your current skill base. All techniques will be taught with an emphasis on final minor adjustments using minimal force and short and long lever techniques. This bespoke training course has been delivered and taught to therapists worldwide, with the OMT team, training prestigious organisations such as the medical teams at Liverpool FC and Manchester City FC. OMT Advanced Spinal Manipulation is aimed at therapists with previous experience and relevant qualifications within manipulative therapies, such as Osteopaths, Physiotherapists, Chiropractors, Sports Therapists we aim to take your skills up to the next level with this challenging and highly rewarding technique classes. This course is a 2-Day (one weekend) introduction to OMT Advanced Spinal Manipulation. Clinical decision making and evidence informed medicine related to the use of HVT thrust techniques. Benefits of HVT thrust techniques versus non-thrust techniques. Identification of difficulties experienced in the application of HVT thrust techniques by participants. Common problems, mistakes and issues within locking a joint, applying HVT to joints. Patient comfort and positioning for effective technique. Upper Cervical Spine: OA - AA. Mid cervical and lower cervical spine thrust techniques. In simple terms yes you can. As an Allied health professional (Physiotherapist, Osteopath or Chiropractor) these skills should be automatically added to your current insurance to practice with no additional cost, but please check with your insurer. 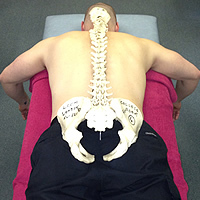 Non-Allied health professionals such as Sports Therapists, Sports Massage Therapists and Manual Therapists from different backgrounds can still gain full public liability cover to use these techniques within their clinics. You may be required to take out an additional policy specifically for manipulative techniques and we work with a number of UK based insurers such as BGi.uk Insurance who can provide full cover (between £1million and £5million cover) for a minimum additional cost.